New attitude towards literacy with a Common Core twist! This image represents my store's mission, which is to help teachers (myself included!) wrap their minds around the shifts in literacy with the new Common Core standards by empowering them with engaging, rigorous materials to share with their students. Reading and writing are my passion. Helping children become independent, critical thinkers is my life's work. 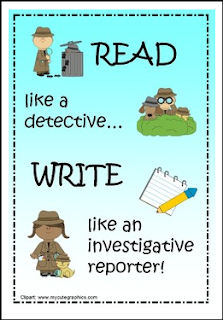 Check out my common core aligned text detectives for K-2 readers! Perfect for setting a clear and focused standards based purpose for reading. Please click the follow me button to be informed of my latest products.